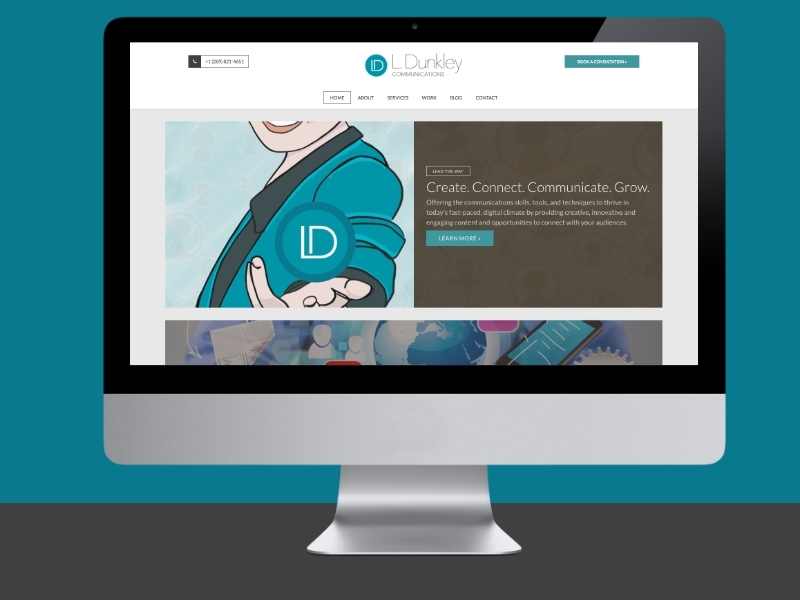 L. Dunkley Communications receives a new brand design that includes logo, colours, website, and content. After 5 years in business, L. Dunkley Communications continues to grow and the brand evolves. Laura Dunkley, Principal of L. Dunkley Communications, continues to work with her clients as they grow and evolve to meet the demands of communicating in a digital, fast-paced business climate. Laura works one-on-one with business leaders and their communications team to develop communications strategies and training to help them stay current and competitive. Her extensive network of creative and business professionals continues to grow, offering just in time expertise throughout various stages of the communications process. “One thing I learned over the years is that effective communications strategies and techniques, supported by strong and authentic leadership and values, is still very important, and possibly more important now. Clear, concise, and current communications best practices offer the ability to respond to the growing demands of constant change, especially in the 24/7 world of social media and online conversations where reputations take time to build, and moments to lose.” - L. Dunkley, Principal L. Dunkley Communications. A new look that is classic and modern, earthy and professional. The earthy muted look of the original design has now evolved into a fresh, crisp, and brighter look. Wanting to go with a nice blend of classic and modern look to represent the timeless need for communications in today’s ever evolving, technologically driven business environment, we went with a circular logo, flat design, and clean lines. The colours were chosen to be a blend of cool and warmth. The blue-green dominates the brand with a cool, yet modern variation on the traditional blue or green of the business world. It is a look to show that in communications we must always remain calm and cool when challenges arrive, but we can do it in a creative, innovative, and inspiring way. The browns give a balance to the look by grounding it. A reminder that we must always stand strong and firm; to represent ourselves and our organizations in a truthful, ethical, and compassionate way. The choice to go with blue-greens and browns also represents the core values of L. Dunkley Communications; with a passion and focus on promoting wellness and sustainability in our communities. The website design is based on a TYMBREL template provided by CMSIntelligence, a Canadian website design agency located in Niagara, Ontario. An easy to use content management system means updates can be done often and easily; saving time. CMSIntelligence offers regular software updates, a secure platform, and hosted servers located in Canada. Brand development and logo design created by the team at CMSIntelligence. Graphics design work by Laura Dunkley.